It's always a red letter today for a writer when a new novel comes out, so I am delighted that my new novel, Invisible, published by Accent Press, is now up on Amazon: http://amzn.to/1t1Kcsm. At £1.82 it is a snip. The paperback will be available shortly. The roots of this novel are in a trip that my husband and I took to Sweden in 2001, so it's been on my mind a long time. It's a stand- alone suspense novel written from several viewpoints. When the novel opens Lisa is in the perfect relationship. Once a month she escapes from caring alone for her son, who has cerebral palsy, and meets Jay, just for the weekend, free from all responsibilities. It’s perfect - until the day when Jay doesn't show up, and everything she thought she knew about him turns out to be a lie. For Jay it was perfect, too. Five years ago he fled witness protection after his wife and son were murdered and began a new life. But he shouldn't have let himself fall in love with Lisa, because now the villains are onto him and he must disappear again. There'll be a book launch. I'll keep you posted. Congratulations! It sounds great, I've downloaded it already. Good luck with the launch. Thank you! That's so encouraging. You might well have been the first. Ok I have downloaded it. Really great to know you have another book out, good luck with it, and I'm looking forward to reading it. Thank you! I hope you enjoy it. It is a thrill to have a book out again. Your number one fan in New Zealand has just downloaded it...along with Footfall. So pleased, and the jacket art on Invisible is very striking. Bless you, Deb. 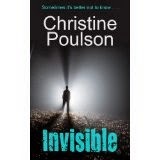 Glad you like the cover for Invisible.